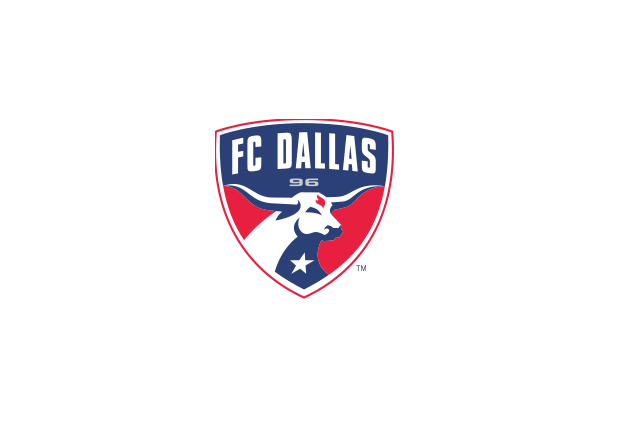 - The FC Dallas logo runs along the inside of the collar. This shirt was my first American shirt that I added to my collection. It was on sale for a relatively low amount of money and I thought that I would best own a shirt from North America. It was either going to be this one or the season before when the sponsor on the front only said FC Dallas which I am never a fan of. The shirt design is decent enough. I like the grey horizontal stripes across the front. They add an extra dimension of colour to the shirt. Originally, Dallas Burn played in a predominantly red-and-black color scheme, and had a logo which featured a fire-breathing black mustang behind a stylized red "Burn" wordmark. The logo and the original colors of red and black were revealed at an event in New York City on October 17, 1995. The team re-branded as FC Dallas in 2005 to coincide with their move to Pizza Hut Park, and has since played in a color scheme of red, white, silver, and blue and a kit design of horizontally hooped stripes. The colors are officially listed as Republic Red, Lonestar White, Shawnee Silver and Bovine Blue.